Ethereum smart contract developers know that smart contracts are self-contained in their own supporting blockchain. Contracts have very little capability to interact with other blockchains, the Internet and the rest of the world . Currently, external information can only be fed into Ethereum contracts by trusted authorities (probably, the developer of the contract) who need to sign claims about the state of the world. These are called “ oracles ”. But relying on a single oracle completely defeats the point why smart contracts are used in the first place. It’s not “trustless” and leaves too much space to contestation, repudiation and tampering. Mission-critical smart contracts aren’t viable without decentralized and trustless oracles. “Witnet nodes which also run an Ethereum node, have full access to the Ethereum blockchain and have the capability to operate with ether and make contract calls”. Results reporting . Ethereum bridges are also in charge of reporting the results of those requests back to the originating contracts. In exchange for performing this work and spending their own ether, they are rewarded with Wit tokens that were allocated for such purpose in the request transaction. Let’s say Alice and Bob want to create a smart contract paying one or the other depending on how’s the weather like tomorrow at noon in London, UK. If it’s sunny, the contract will transfer all available funds to Alice. If it rains, the contract will transfer all available funds to Bob. In any other case, the contract will split the funds and return them to Alice and Bob. All that Alice and Bob will need to do is writing an Ethereum smart contract that includes a Witnet request querying any publicly available weather API, extract the weather condition and report it. The request can even use several data sources and specify how to normalize and aggregate the results. For convenience, there’ll be a library that will allow Ethereum contract developers to build Witnet requests using Solidity inside their own projects and include them into their existing workflows thanks to Truffle . Then, when the Ethereum contract is deployed and funded, the “weather contract” will post the request and register itself to the Witnet Bridge Interface contract . A bridge node realizes its leadership position (Witnet nodes can easily calculate if they’re leaders for the current block, but they can’t predict their leadership for future blocks) . 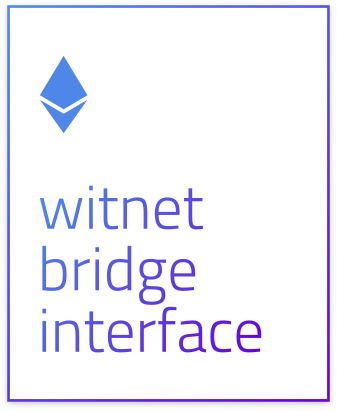 The bridge node then reads all the unassigned requests that have been posted to the WBI contract and __ “cross-post” them into the Witnet blockchain . As soon as the requests get included into a Witnet block , the node will be able to generate a “Proof of Inclusion” for each of them. These proofs irrefutably prove that the request was published in a certain block in a similar way to how Bitcoin’s SPV works for transactions. Finally, the bridge node makes a call to the WBI contract including both the Proof of Inclusion and a Proof of Leadership . The WBI contract internally verifies both proofs and, if valid, sends the ether reward to the contract caller. Now you’re surely wondering: “ How can an Ethereum smart contract verify transactions from other blockchains? Is that even possible?”. Sure it is! All thanks to block header relaying. In order for the WBI contract to verify Witnet Proofs of Inclusion and Proofs of Leadership , it needs to be aware of all the Witnet blocks to date . That’s possible also thanks to bridge nodes. For every Witnet epoch, one bridge node wins the right to act as a block header relayer . Block header relayers are in charge of disclosing new Witnet blocks to the WBI contract. In doing so, they’ll get a percentage of the ether fees attached to all the eth-to-wit requests that ended up being published in that block. This scheme is expected to consume a significant amount of gas, as proof verification will likely require quite a bunch of hashing rounds. But it completely succeeds achieving its purpose of allowing the WBI contract to trustlessly verify that the request was published to Witnet by the contract caller. requestId : the identifier of the request so that the WBI can correlate the result with the original request and report it to the requester. result : the value returned by Witnet from resolving the request. proofOfLeadership : proof that the reporting node holds epoch leadership . proofOfInclusion : proof that the reported value was actually included in the Witnet blockchain as a result for the original request. As the WBI contract will be aware of all Witnet blocks to date, it’ll be capable of validating all those means of evidence. It’ll also ascertain without a doubt that the reported value is exactly the same as published in the Witnet blockchain . Then the WBI will use the requestId to look for the address of the requesting contract in an internal mapping(uint => address) and report the value ( “sunny” , in this case) to that contract address **** by calling a reportResultFromWitnet function in the contract. The reportResultFromWitnet function will need to include a require(msg.sender == WBI_ADDRESS) guard so that *only the WBI can call it* . To keep gas consumption as low as possible for the bridge node, this function should just store the reported value and do nothing else. Then, there should be a separate function (let’s call it triggerResolution ) that either Alice or Bob should call to trigger the resolution of the contract, evalulate the reported result value and release the funds accordingly. If immediate or unmaned resolution of the contract is strictly required, the reportResultFromWitnet function can be written to directly call the triggerResolution function. However, this will increase gas consumption for the bridge node. Thus, if Alice and Bob designed their contract in this way, the ether reward attached to the Witnet request will need to be enough to compensate for the extra cost. Question: What if the amount of ether that Alice and Bob attached to their Witnet request wasn’t enough to reward the three employed bridge nodes (eth-to-wit, block relayer and wit-to-eth) because of a sudden gas price rise or for any other reason? Don’t panic — the WBI contract will provide an upgradeReward function for increasing the reward at any time . Once this function is called providing enough funds, the escrowed reward will be released to the reporting wit-to-eth bridge node and the call to the reportResultFromWitnet function in Alice and Bob’s contract will finally progress just as expected. Boom. Ethereum contracts now have real power! Want to know more about the use cases of Witnet? Introducing Witnet: smart contracts with real power!